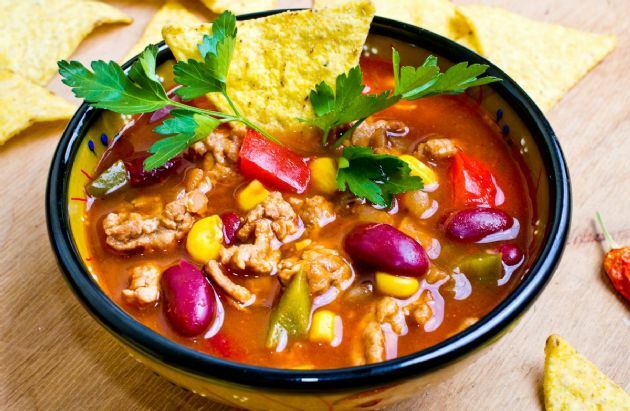 Top this soup with toasted tortilla strips and serve with lime wedges and avocado slices. Top this soup with toasted tortilla strips and serve with lime wedges and avocado slices. Just before serving, squeeze in the juice of half a lime for a kick. Brown the ground beef and onion in a large saucepan over medium heat. Blot any excess grease with a paper towel, then add the taco seasoning. Cook for one minute, then add the tomato sauce, diced tomatoes, kidney beans, and one cup water. Reduce heat to medium-low, and simmer for 10 minutes. Add the corn and mashed garbanzo beans, and simmer five more minutes. Serve immediately. Makes six (1 cup) servings. Good catch! We added that to the notes section. It's really optional, but it does boost the flavor.